The Afghan War, which lasted nine years, claimed the lives of nearly 14,000 Soviet servicemen, while another 50,000 were wounded. The military campaign still raises many questions among historians and veterans alike. 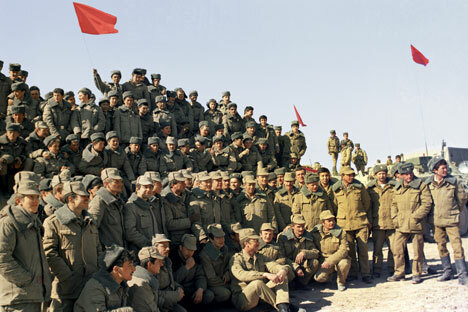 The Soviet invasion of Afghanistan began in December 1979, when a KGB special-purpose team, with support from army units, overthrew the leftist president Hafizullah Amin, who tried to reduce the country’s dependence on the USSR and strengthen relations with Iran and Pakistan. Prior to the invasion, there were even reports that Amin had held a meeting with anti-communist warlord with Gulbuddin Hekmatyar. At first, Soviet generals thought that the mission in Afghanistan would be a brief and easy one, but very soon it turned into a long and draining war. They entered into a clash with a handful of fanatics but by 1989 were fighting against a well-organized rebel army backed by resources from the West, Arab countries and even China. No other rebel movement in the world has ever enjoyed such large-scale outside support. Crossing that bridge into Afghanistan was easy but crossing it on the way back from Afghanistan turned out to be very hard. In the summer of 1983 Soviet ambassador to Kabul Fikryat Tabeyev said: “There is Andropov in the Kremlin now, he understands how pointless our military presence in Afghanistan is. Soon everything will change.” But Andropov died, to be replaced by ailing Chernenko, who did not get enough time to look into the Afghan issue. Thus it was only with Gorbachev's coming into power that the Soviet Union began to look out for ways out of the Afghan trap. “We were thrown into burning lava,” recalls Col Vladimir Savitsky, from the Airborne Troops. Like many other Soviet servicemen, after nearly 10 years of fighting in Afghanistan he will not be shaken out of his conviction that that country “cannot be defeated with weapons alone.” But the ideology imported by the USSR was rejected by the Afghan society. “We were losing on the ideological front. People there were very religious. We should not have tried to build socialism there at all,” he says. Savitsky recalls that the Afghans were extremely sensitive when it came to interference in their life but were always happy to accept humanitarian aid from Soviet servicemen. A veteran with the special-purpose unit Alfa, Sergey Goncharov, who too took part in the Afghan campaign, has similar memories. “When we captured a village, we brought doctors with us, who were called tabibs, and we helped locals with food. Ours was a completely different attitude. The Americans are acting differently: for them it is just territory that they have to capture,” he says. The U.S. military studied the Soviet experience in Afghanistan but ended up caught in the same trap as the USSR because the Afghans are equally hostile to godless socialists as they are to western democracy. For the USA, a swift anti-terror operation too turned into a protracted war. “Twenty-five years have passed and it is hard to judge those events, whether they were good or bad. At least we thought that we were fighting for justice and we had no doubts,” says Alfa veteran Sergey Goncharov.